Tax day has come and gone. I am at home recharging my batteries and energizing my brain after putting in long hours preparing and filing as many tax returns as possible as well as a ton of extensions. I want to give heartfelt thanks to all of you who made a conscious decision to allow me to prepare your tax return; business, individual, trust, and partnerships. And to those of you that are on extension, I will be working on your return when you provide the missing information. Lastly, as most of you know, I help many businesses and individuals who owe back taxes (even from 2017) or have other tax problems evaluate the many options that are available to pay down this debt. I have received three calls this week alone to help with payroll, sales tax, and back tax issues. We are here all year to help you manage any tax matter that you may have. Let us know how we can help you. I would personally like to thank our family, clients, and business associates that have referred business to us during this tax season. 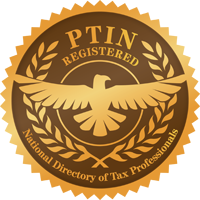 Please remember us when you hear of a new business opening, a friend or acquaintance that was dissatisfied with their current tax preparer or who has received a notice from the IRS or the State of Florida (Department of Revenue). I look forward to helping you now and in the future.